From Mediaite: It is unclear where Snowden is at the moment, but we’re pretty sure he’s still in Russia. Reports Mediaite, “While the U.S. has been pressing Russia to hand Snowden over, and also talked to China and Hong Kong, ‘at this point it looks like Mr. Putin holds all the cards,’ Doocy argued. And even though there’s been promise of retaliation, the hosts questioned what the U.S. could really do. 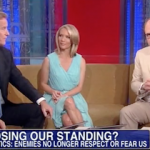 ‘I’m sure Putin is shaking in his boots,’ Dana Perino quipped. Pointing to Sen. Lindsey Graham‘s (R-SC) criticism that our enemies no longer fear us and no one seems to respect us, Doocy reiterated that Putin has the definitive upper hand in the situation.” Read on here. 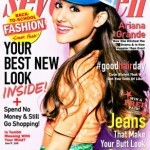 From Gossip Cop: In the August edition of Seventeen Magazine, Ariana Grande opens up about how unhappy she was on Victorious. Gossip Cop reports, “The actress reveals that there was some behind-the-scenes drama on ‘Victorious,’ the hit Nickelodeon show on which she played Cat Valentine. ‘I worked with someone who told me they’d never like me,’ says Grande. ‘But for some reason, I just felt like I needed her approval. So I stared changing myself to please her. It made me stop being social and friendly. I was so unhappy.’ But Grande has nothing but praise for her co-star on ‘Sam & Cat,’ which spun off from ‘Victorious’ and ‘iCarly.’ ‘I am so lucky to be working with Jennette McCurdy,’ Grande tells the magazine.” Read on here. From Geekosystem: Hey, other humans! We can move now, if only we can figure out how to get there. Geekosystem explains, “An international team of researchers and astronomers have found what could be the motherlode of habitable exoplanets in a nearby star system. 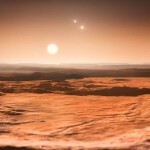 According to a new examination of the data, researchers believe the nearby star Gliese 667C — found just 22 light years away in the constellation Scorpius — hosts six planets. That’s twice as many bodies as the star was thought to be home to, but that’s not the big news. The big news is that three of the planets orbiting Gliese 667C are thought to be in the habitable zone, capable of hosting liquid water, and possibly able to support life.” Read on here. From Styleite: In Lagerfeld’s Fall Campaign, he has his bodygaurd and a mega babe as the leading stars. Reports Styleite, “We imagine that being Karl Lagerfeld’s assistant would come with some really bizarre pros and cons. But Sébastien Jondeau, who has worked as the Kaiser’s P.A. and bodyguard since 1999, has bigger responsibilities than Instagramming cat pictures and bigger perks than AYCD Diet Coke: He’s now the face of Lagerfeld’s fall campaign. It’s not hard to see why Jondeau was asked to get in front of the camera. He’s the lucky owner of rugged good looks, which Karl probably saw as going to waste on a semi-secret Instagram account comprised primarily of surprised-face selfies.” Read on here. 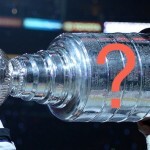 From SportsGrid: Where is the Stanley Cup now? SportsGrid is following it live: “The Chicago Blackhawks are back in Chicago. Not for Game 7, as it may have seemed if you turned your TV off with 1:30 to go in Game 6 (sorry, bandwagoners! ), but because they are your 2013 Stanley Cup Champions. This means… they have the Stanley Cup. In Chicago. But, where exactly is it? Undoubtedly, on the move, somewhere near hammered hockey players. We at SportsGrid do not have a reporter on the ground, sadly, but Redeye Chicago does (and the guy’s name is Mick Swasko!!! ), because they are American heroes. Follow their #CupTracker here. Search that on Twitter, if you’d like.” Read on here. 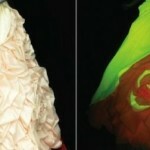 From The Mary Sue: Colored, black light fabric? The Mary Sue‘s Brooke Jaffe writes, “Mutant silkworms may not be joining the X-Men any time soon, but they are certainly producing fabric that would be great for some other cosplay purposes. By imbuing the worms with DNA from organisms with glowing genes, the silk these worms produce fluoresces under black light. Only three colors are available so far (green from jellyfish, red and orange from different kinds of coral). From Wired.com: ‘Scientists bred and reared more than 20,000 of these transgenic silkworms in the lab, feeding them mulberry leaves, harvesting their shimmering threads and working out how to turn the raw, glowing cocoon silk into a functional material. '” Read on here. From The Jane Dough: Do you think that you’re doing everything right in your job hunt? Are you still looking? Maybe you’re subconsciously doing things that are ruining your chances at getting hired. The Jane Dough writes, “The job hunt isn’t easy. Talk about an understatement, right? But, seriously, in today’s tough job market, even the most innocuous things can make or break your chances of nabbing that plum gig. Don’t believe us? Check out what these two HR experts had to say about the eight biggest interview mistakes people make. But there are a few easy things that you can do to improve your job search, like avoiding these six self-sabotaging moves. Case in point: Ever heard of the 60-second mistake? Neither had we!” Read on here. From The Braiser: Paula Deen’s sons, Bobby and Jamie Deen say that she isn’t a racist because she once bought Hank Aaron’s pajamas for Jamie. Just after Bobby mentions that she is one of the most compassionate, good-hearted people that you will ever meet. The Braiser reports, “Is this a great defense or the greatest defense? We haven’t decided, yet, whether it’s better or worse than ‘she’s old and from the South.’ Jamie and Bobby Deen made an appearance on CNN’s New Day this morning (via satellite from Savannah, Georgia, natch) to discuss their poor mother’s ‘character assassination.’ They insisted to Chris Cuomo that Paula Deen is not a racist, nor has she ever demonstrated racist tendencies, which Jamie went on to illustrate with this beautiful story, told in completely hilarious sincerity.” Watch on here.